Become the Norse Viking god of thunder and heroic Asgard warrior in our Thor Movie Deluxe Adult Costume. It will transform you into a new kind of superhero known as the Mighty Avenger. Our adult Deluxe Thor Movie Costume includes a printed graphic jumpsuit, detachable red cape and a molded character helmet with wings. 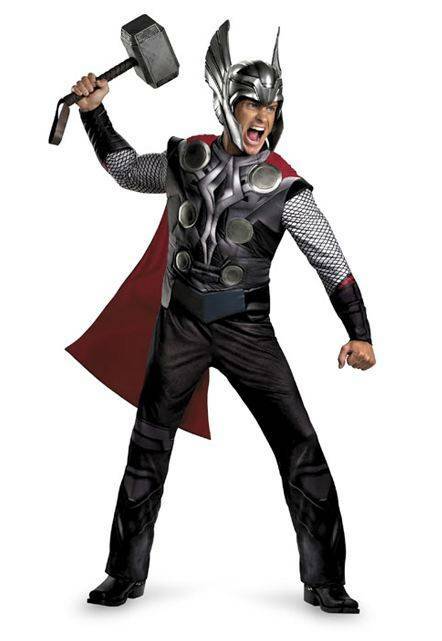 It will be up to you to save the party from evil forces bent on destroying it in our men's deluxe Thor Movie costume. In the 2011 Thor: The Mighty Avenger film, the Mighty Thor is portrayed by Chris Hemsworth as a powerful and arrogant warrior whose reckless actions reignites an ancient war. As punishment, Thor is cast down to Earth by his father Odin and forced to live among humans. While on earth, he learns what it takes to be a true hero when the most dangerous villain of Asgard sends evil forces to destroy the world. Thor must wield his powerful hammer Mjolnir to save Earth in an extraordinary battle. This is an officially licensed Thor: The Mighty Avenger� movie product by �Marvel Studios.